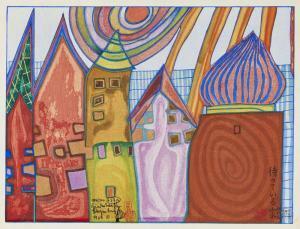 Find artworks, auction results, sale prices and pictures of Friedensreich Hundertwasser at auctions worldwide. 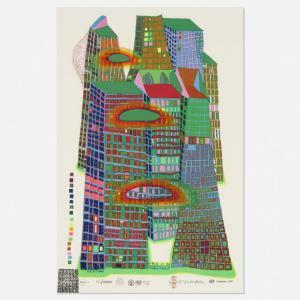 Friedensreich Hundertwasser Good Morning City (Series C) 1969 screenprint with metallic embossing on Fabriano paper 33.25 h × 22 w in (84 × 56 cm) This work is number 122 from the edition of 500 of the Series C variation and 522 from the overall edition of 10,000 printed by Studio Quattro, Campalto-Venice and published by Dorothea Leonhart, Munich. 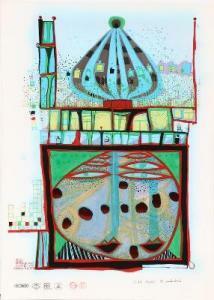 Literature: Hundertwasser's Complete Graphic Work 1951-1976, Schmied, no. 686ConditionPrint shows two short surface abrasions near center of upper left quadrant. Lowest circular element shows a small area of spidering to pigments, with no indications of losses or inpainting noted. 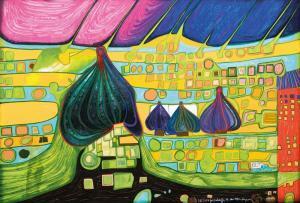 Colors have remained vibrant over time. Very good condition. 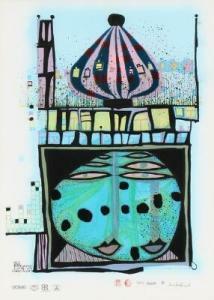 Framed behind acrylic measuring 39 x 27 x 2 inches.